CALS Awards recognize faculty and staff with 13 different awards. Each May, the winners are celebrated at a ceremony and reception. The event also honors faculty awarded professorships during the past year. These awards recognize individuals who have demonstrated outstanding service to their communities, their chosen career fields and the citizens of the state and nation. 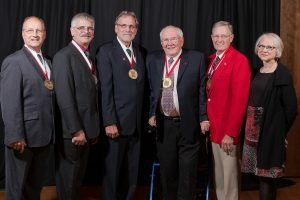 There are three awards: the Honorary Recognition Award, the Distinguished Service Award and the Distinguished Alumni Award.